I have to admit, Milan is a city that has never particularly appealed to me. This sprawling metropolis and global capital of fashion and design in the north of Italy was pretty low on my bucket list of European cities to visit. Nevertheless, when the kind folks at Menabrea offered to take me and a small group of writers and photographers on a two-day trip of the region, taking in the historic town of Biella and the city of Milan, I was hardly going to say no. After passing a tranquil and serene evening at the Sanctuary of Oropa, a stunningly beautiful Roman Catholic pilgrimage site in the municipality of Biella, we descended from the mountains and into the bustling hubbub of the city. Any preconceptions I had about Milan proved almost immediately to be unfounded. Instead of drab, grey skyscrapers and noisy, polluted streets, we found ourselves immersed in a vibrant, multicultural and profoundly beautiful city. Based in the old-town, just a stone’s throw from the iconic Duomo di Milano, we experienced the full extent of Milan’s cultural heritage, architectural beauty and gastronomic excellence. With just under 24 hours to explore the city, time was of the essence. After two Aperol Spritz over lunch, and armed only with my phone (and camera) I set out to navigate Milan’s subway network in search of an authentic Italian beer experience. My first port of call is Hops Beer Shop, a small taproom and bottleshop located in the northern part of the city centre, a short walk from Moscova underground station. The shop opened around three years ago, and has proved to be a success, with its owners also now operating a cocktail and beer bar in Milan, and one in Trieste. The clock ticks on; ten past, quarter past, and still no signs of life stir from inside the darkened shop windows. I’m about to cut my losses when around the corner bounds the figure of Paolo Martuccelli, one of the shop’s owners. Chattering away loudly in Italian on an earpiece, he opens up the shop and gestures me inside. While Paolo finishes his phone conversation, my eyes scour the fridges. 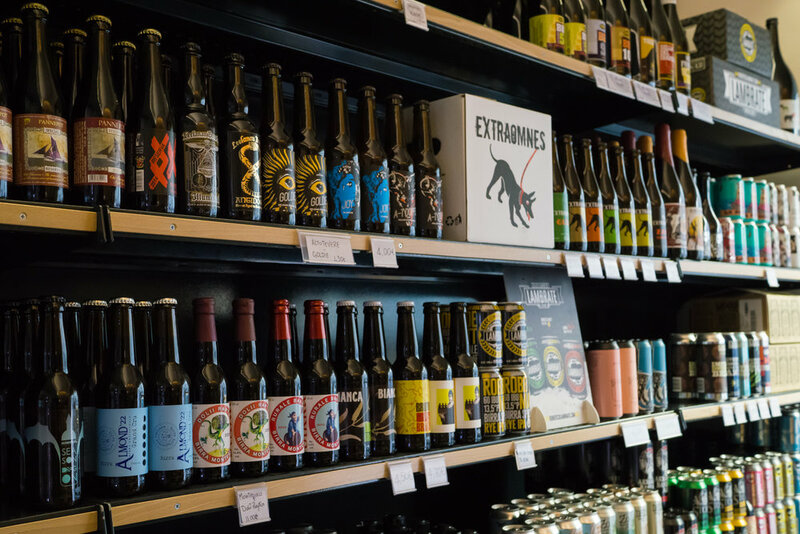 British beer is well represented, with cans from Moor and BrewDog in good supply, while there is also a heavy Belgian contingent in the form of De Struise and Westvleteren. “Do you speak English?” I ask Paolo as he finishes his call. “Yes, of course,” he replies. “Good, that’ll make this a hell of a lot easier,” I reply, thankful my rusty Italian won’t be required today. 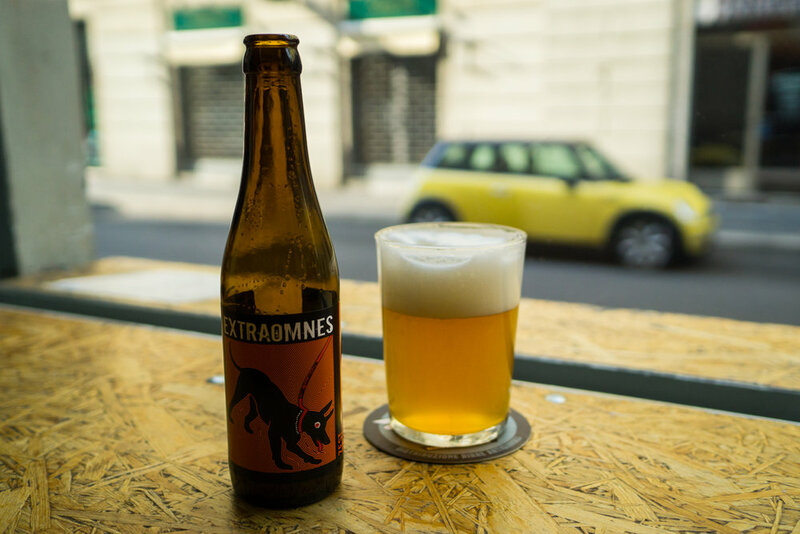 I ask for a recommendation of something Italian, and after foolishly declining the offer of some freshly canned CR/AK, settle on a bottle of Extraomnes Zest, a 5.3% Belgian Pale, brewed around 30 km northwest of Milan in the Province of Varese. The beer is, generally speaking, pleasant, but with its grassy, slightly peppery aromas and phenolic, Belgian yeast notes, it’s not exactly Italian, and not really what I was looking for. Disappointed, but not disheartened, I try again, this time ordering a Wave Runner, a west coast IPA from Hammer – Italian Craft Beer, an award-winning brewery around an hour to the north east of the city. Dry, peachy and classically bitter, it rasps across my tongue and goes down rather more quickly than I’d have liked. Feeling content, but not completely satisfied, I hop back on the subway, heading further out into the suburbs to Lambrate, a rather more rough and ready district in the north east of the city. It’s here that Birrificio Lambrate, the city’s oldest craft brewery is located. Founded way back in 1996, Birrificio Lambrate was Milan’s first brewpub and one of Italy’s first microbreweries. Set against the looming forces of industrial beer, the brewery quietly set about challenging the status quo. Twenty two years later, production has moved to a production site a couple of miles down the road, but the pub remains almost untouched, with 18 taps pouring exclusively Lambrate beers. I arrive around forty minutes after opening, and the venue is already heaving, locals spilling out onto the streets and conversing loudly in the sunshine. The pub’s wooden furnishings and golden tap handles wouldn’t look out of place in the Czech Republic, but the atmosphere inside is akin to a busy Friday night down a community boozer in the UK. 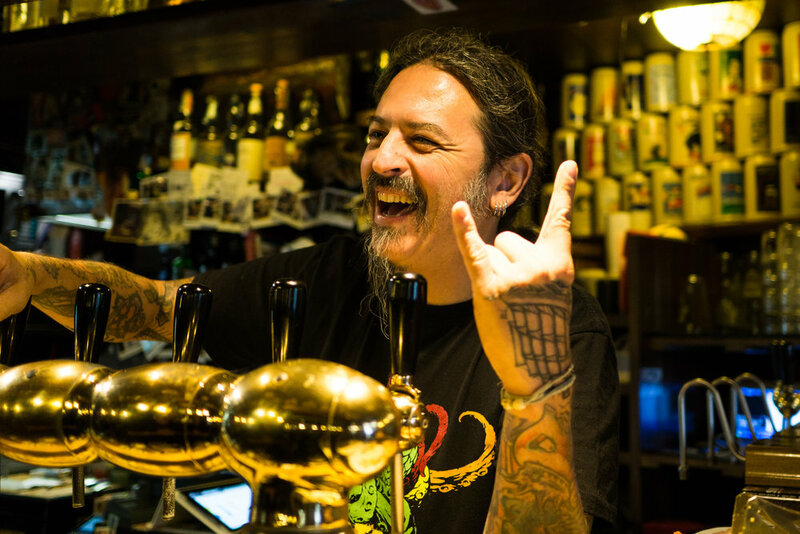 Feeling a little intimidated, I approach the bar, spotting the familiar face of Giampaolo Sangiorgi, the brewery’s heavily bearded and tattooed owner, and ask for a recommendation. Smiling warmly as I explain who I am, and what brings me to Milan, he pours me a glass of the brewery’s American west coast pilsner. I ask him how much I owe. “How many beers are you staying for?” he responds. “Probably two – I’m due for dinner at eight,” I reply. “Ok, you pay for the next one,” he laughs, before turning to attend to the growing throng of customers at the bar. Sipping on the bold, aromatic and slightly citrusy pilsner, I find myself chatting idly to the gentleman next to me at the bar, a half English, half Italian man named Paolo, who frequents the pub often on his visits to Milan. I ask about snacks laid out across the front bar, wondering if I have accidentally stumbled across a private party, wedding reception, or particularly raucous funeral wake. Paolo explains that Giampaolo provides a selection of light aperitifs for his customers daily, free of charge, Watching the locals break bread and chat together, I am transported back to the days when my dad and I used to head to the pub together on a Sunday, where a selection of cheese and crackers would be laid out for anyone to help themselves to. I order myself another beer, this time opting for the brewery’s Hazelnut porter, which is served on cask from one of three handpumps at the end of the bar. Once again, Giampaolo refuses to let me pay. 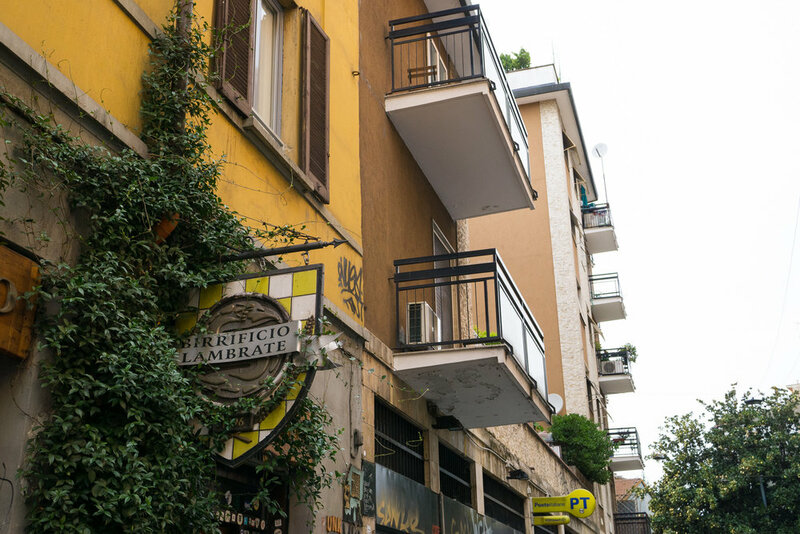 With a charismatic owner still ducking, weaving and strutting his stuff behind the bar, a friendly group of loyal clientele, and a wide array of beers produced locally, Birrificio Lambrate is the authentic Italian beer experience I’ve been looking for. Happy, and a little drunk, I bid my newfound friends farewell, and head off into the night in search of pizza. Full disclosure: This post was written after a trip paid for and organised by Italian brewery Menabrea. This didn't influence the content contained here, because its not even about them. Duh. Sipping on the golden nectar straight from the source is a transformative experience. The region’s producers are increasingly turning to oak to add a local dimension or added complexity to their beers. There are great times to be had and stories to be told in every corner of this magical county. “In my job I’ve been lucky to travel to festivals all over the world, and ours was one of the best."